A film noir salute and satire, Dead Men Don't Wear Plaid has one trick up its sleeve but wears out its welcome relatively quickly. The splicing of clips from old classic movies into the film's narrative is only a modest success, and too often the story bends awkwardly to accommodate the next available fragment from the past. Private detective Rigby Reardon (Steve Martin) is hired by the smouldering Juliet Forrest (Rachel Ward) to investigate the mysterious death of her father. A noted scientist and expert cheese maker, John Hay Forrest has apparently died in a car crash, but Juliet believes that he was murdered. Rigby is immediately smitten by Juliet and agrees to help. His investigation involves interacting with characters played by Humphrey Bogart, Barbara Stanwyck, Ava Gardner and Burt Lancaster among many others from a host of classic noir films. The sleuthing leads Rigby to two lists of names labelled "Friends of Carlotta" and "Enemies of Carlotta", and an evil plot that is costing the lives of many. The mystery involves a cruise ship filled with passengers, a remote island, a new weapon of mass destruction, and remnants of the Nazi regime hoping to reclaim past glories. Dead Men Don't Wear Plaid is more of an editing workshop than a serious movie. Inserting Martin into classic scenes from noir films including Double Indemnity, The Big Sleep, The Postman Always Rings Twice and Dark Passage maintains a decent amount of interest, but it's all unfortunately at the expense of any absorption in Dead Men Don't Wear Plaid itself. The movie settles into a series of virtual interactions with stars from the past, and on its own, generates no momentum. A story that quickly reaches for the absurd and then purposefully strides towards the inane does not help. A smelly cheese-as-a-weapon narrative boorishly announces itself as a sacrificial lamb at the altar of the editing on display. Martin and Rachel Ward are likable as a bumbling couple, and both over-act with the enthusiasm of stars who do not need to take the project all that seriously. The script gives them a few, but not many, good moments. Juliet is an expert at a bullet-sucking and Rigby is brilliant at always getting shot in the same spot on his arm, and both jokes run out of steam in a hurry. 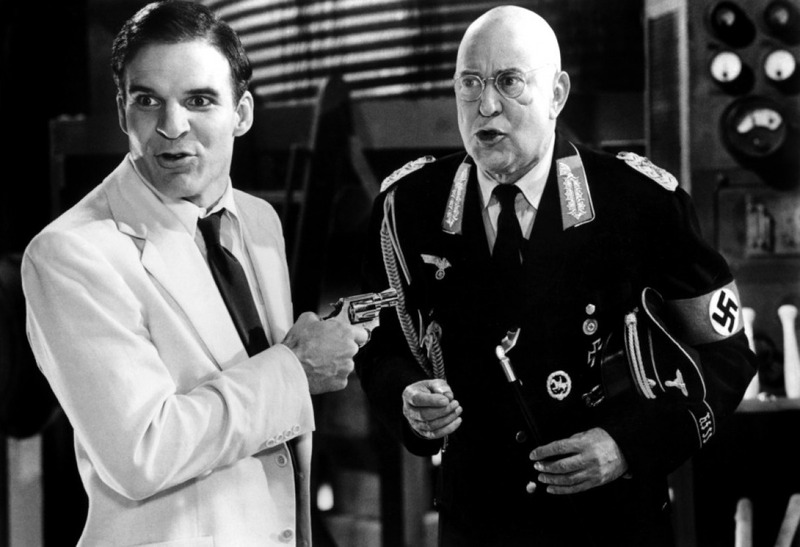 There are at least as many crass moments as clever ones, an unfortunate failing of the script co-written by Martin and director Carl Reiner. Dead Men Don't Wear Plaid is a good idea with average execution, a case of a flawed modern film mostly serving to highlight the enduring impact and star power of the classics.